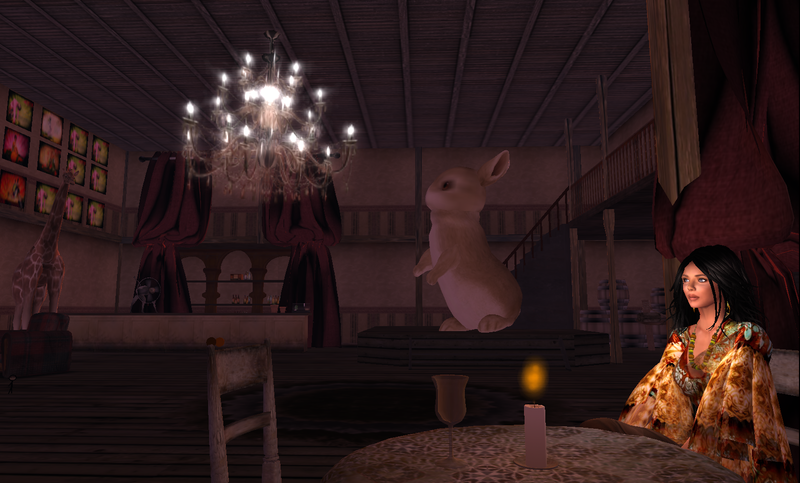 Anyone who thinks magic can't be created with the 3,750 prims available on a homestead sim needs to head over to Minute Papillon, right now! This enchanted spot, the name of which might be translated as "little butterfly," is owned by Jade Koltai. Turn your draw distance up when you arrive, as the sim might remind you at first of the vistas created by AM Radio—a far off horizon of purple mountains and skies encircles Minute Papillon, and you won't catch the effect with your distance on the low side. The landscape here, mesmerizing fields of dried wheat, is beautiful and quiet, the chirping of crickets punctuated by the occasional hoots of an owl. The bronze, copper and russet hues of sprawling wheat fields give way to the darker earthiness of the ground in spots, out of which leafless trees rise. But that's not all that's here—there are signs of habitation, a few buildings and small structures dotting the sim, including something that might pass as a saloon, although its permanent inhabitants comprise a giraffe, a giant rabbit and an elephant. (Try climbing on them and clicking on everything else, too.) Far off in one corner of the sim is an apparently deserted chapel and graveyard. Listen carefully and you'll hear other sounds ... off in the distance ... like a carnival ... and if you search you'll find the source. Incongruously located in the sim is something of a cave containing nothing less than a miniature amusement park, featuring very colorful little toy cars rides and flying vehicles (try them!). (I must admit that I had to clear out of there after a while because of the incessant amusement park music haha!) Every corner of Minute Papillon is lovely, and every spot the best of photo opportunities. My outfit in these photos includes the New Yippie Orange top by Baiastice, Brown Suede Pants from Ce Cubic, Han Hana beads from (luc) fashion jewelry, and Real Toe Studded Wedge Sandals from J's (sadly not visible in the photos, but a nice match! ).